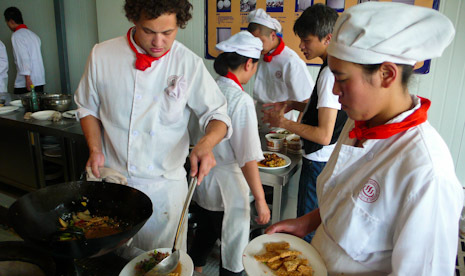 When our professor Long Qingrong takes charge of the class we somehow always cook milder, more homey dishes. It has to be a coincidence: the schedule was finalized and published long before the semester started. Pork Slices with Rice Crusts 锅巴肉片 fall into the 'lychee flavor' category. There are no lychees in the recipe, but the combination of sugar and vinegar in the sauce create a distinct sweet and sour flavor known as lychee 荔枝味. Lychee sauce is delicately pale: there is only a little soy sauce in it. There are also slices of bamboo shoots 玉兰片 and a leafy vegetable known as 'caixin' 菜心. From province to province this name is used for different vegetables, but here it is probably flowering cabbage. 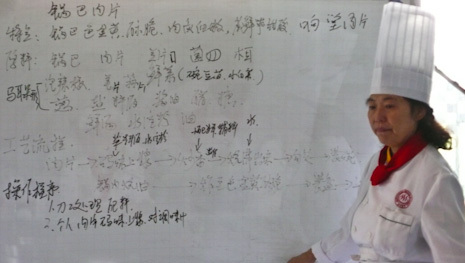 The teacher pointed out that 'caixin' is expensive and wasteful: you pay by weight but only use the tender leaves, discarding the stalks. 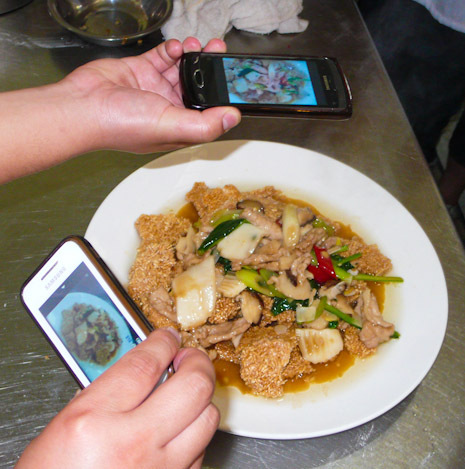 Today's dish #2 is Fish-Fragrant Chicken Chunks 鱼香鸡块. 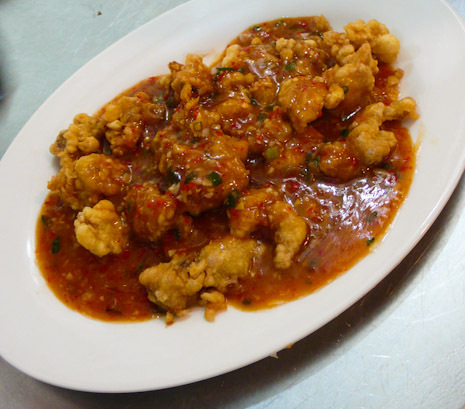 Cubes of chicken thigh are first battered in egg and starch (quite like tempura), then deep-fried and doused in sauce. We've made fish-fragrant sauce quite a few times already, but I find it a useful exercise. 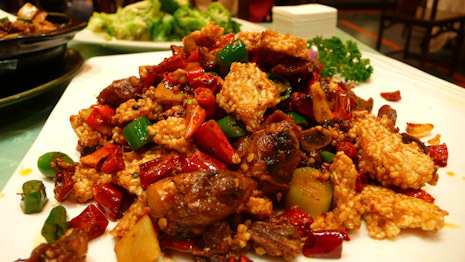 'Fish-fragrance' 鱼香 is as iconic as 'mala' 麻辣, so a good Sichuan cook should be able to make it with his eyes closed. The perfect balance of sweetness, sourness, saltiness and hotness can be quite elusive. To nail it this time I memorized the proportions used by our teacher. However, I cannot describe it any more precisely than 'a little' and 'some': in Chinese cooking, you eyeball everything. Fry minced pickled chilies in a little oil, add minced garlic and ginger, add some water, a spoon of soy sauce, three spoons of sugar, three spoons black vinegar, less than a spoonful of salt, a little more soy sauce, sprinkle chopped green onion. Increase the heat, thicken with starched water, stir in a little oil, pour over chicken chunks. 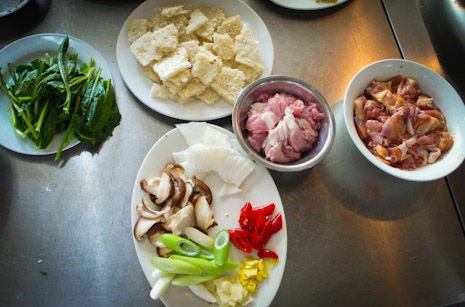 After the fish-fragrant chicken, we set off to make lychee-flavored pork slices with rice crusts 锅巴肉片. Ideally, the dish is put together at the dinner table in front of the guests. When hot sauce is poured over the freshly fried rice crusts they crackle and sizzle. I've always liked dishes with rice crusts ('gouba') 锅巴: their weightless crunchiness favorably offsets just about anything. 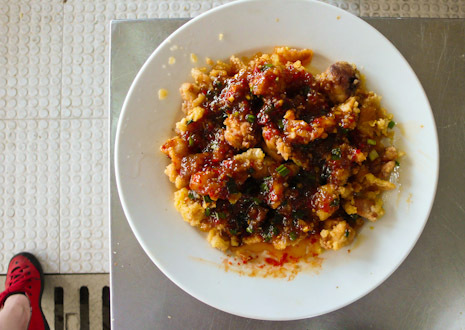 Here is fried chicken with guoba we ate at the famous Chen Mapo Tofu restaurant 陈麻婆豆腐. It looks interesting. I'd like to give it a try.